Automation of Sinter Plant at Posco, Korea Around 1975, my employer, VOEST, constructed a computerized sinter plant in Pohang, South Korea. 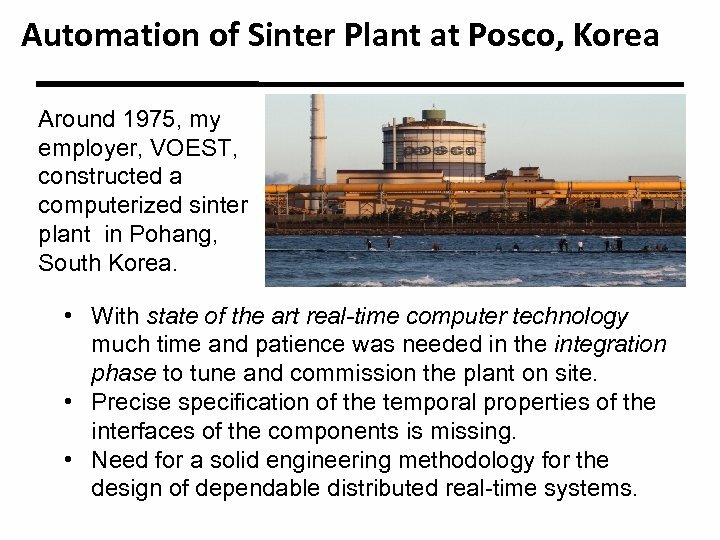 • With state of the art real-time computer technology much time and patience was needed in the integration phase to tune and commission the plant on site. 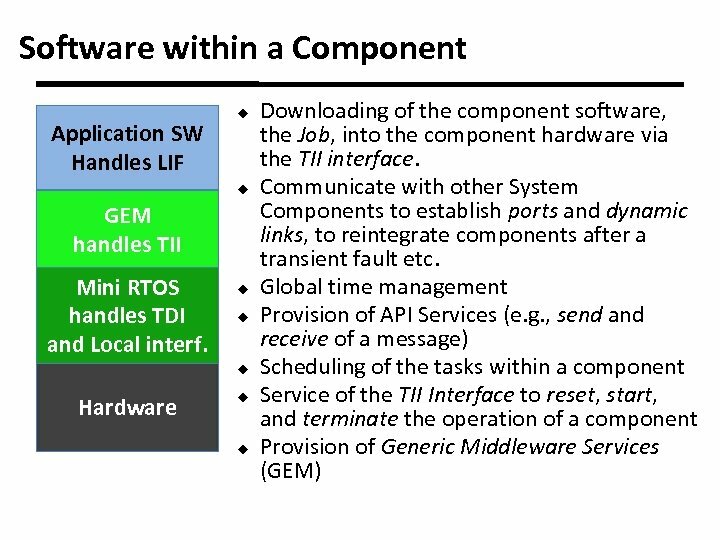 • Precise specification of the temporal properties of the interfaces of the components is missing. 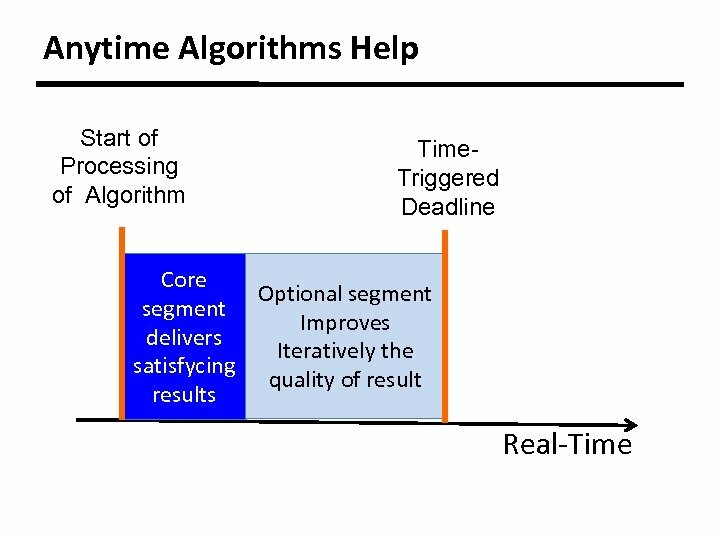 • Need for a solid engineering methodology for the design of dependable distributed real-time systems. 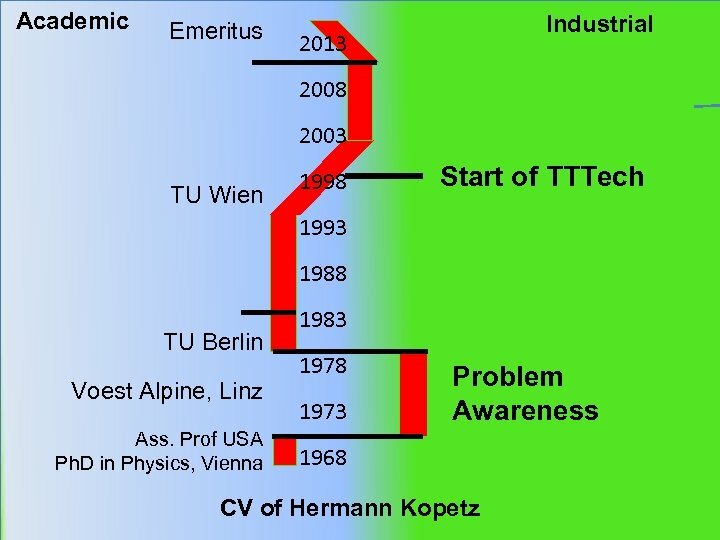 The Objectives of the TTA The TTA is based on more than thirty years of research on the topic of dependable real-time systems. 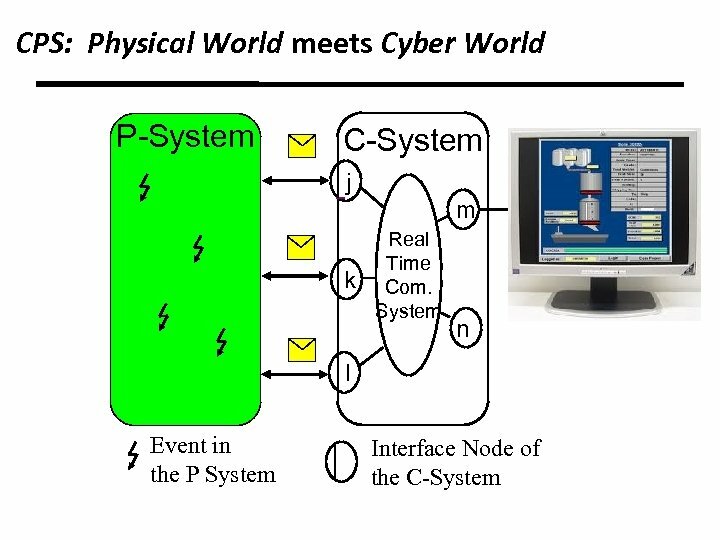 • To establish a platform for the design of dependable component-based cyber-physical systems (CPS) that can be adapted to the needs of different application domains. 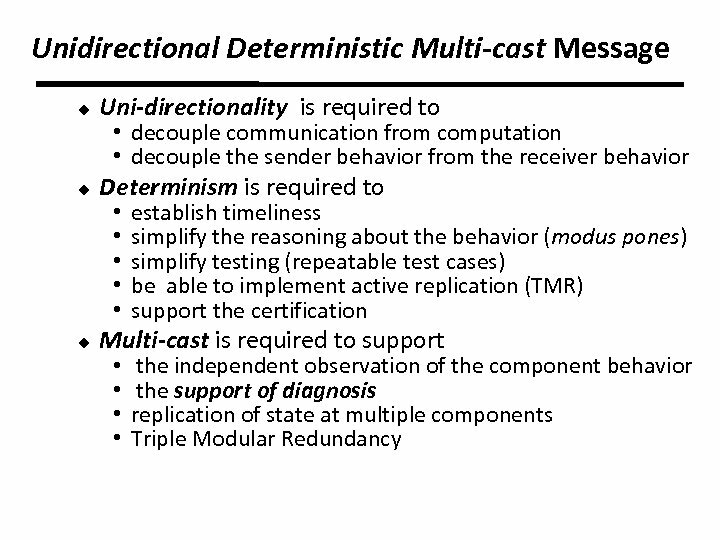 • To provide global coordination in a distributed realtime system without a central point of failure. In order to understand the design decisions taken in, and the dependability mechanisms provided by, the TTA we have to understand the characteristics of CPS. 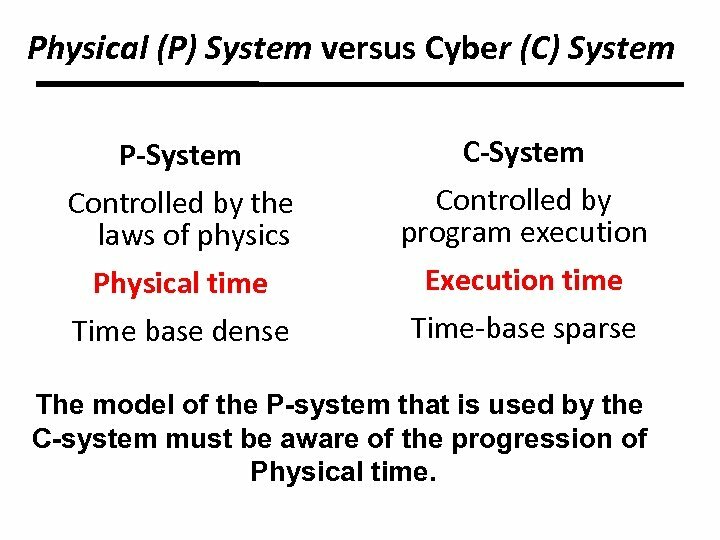 Physical (P) System versus Cyber (C) System P-System Controlled by the laws of physics C-System Controlled by program execution Physical time Time base dense Execution time Time-base sparse The model of the P-system that is used by the C-system must be aware of the progression of Physical time. 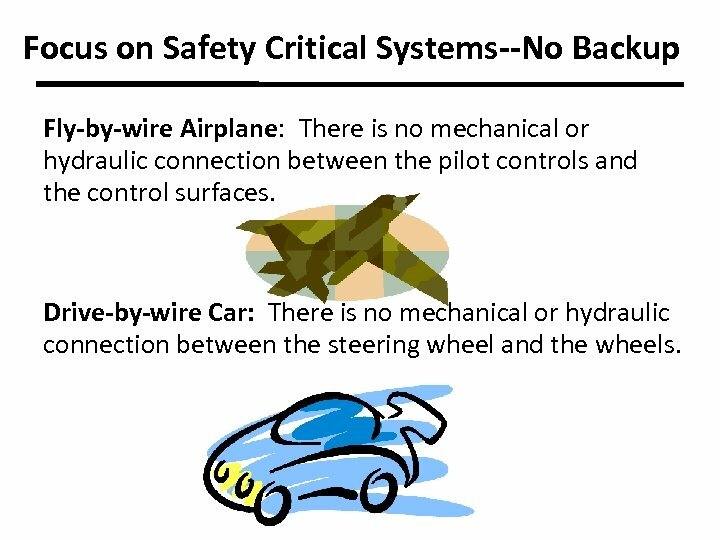 Focus on Safety Critical Systems--No Backup Fly-by-wire Airplane: There is no mechanical or hydraulic connection between the pilot controls and the control surfaces. Drive-by-wire Car: There is no mechanical or hydraulic connection between the steering wheel and the wheels. 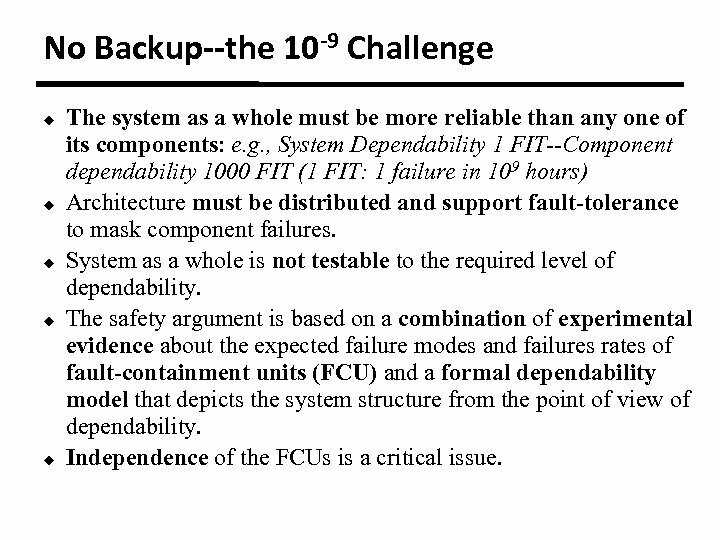 No Backup--the 10 -9 Challenge u u u The system as a whole must be more reliable than any one of its components: e. g. , System Dependability 1 FIT--Component dependability 1000 FIT (1 FIT: 1 failure in 109 hours) Architecture must be distributed and support fault-tolerance to mask component failures. System as a whole is not testable to the required level of dependability. 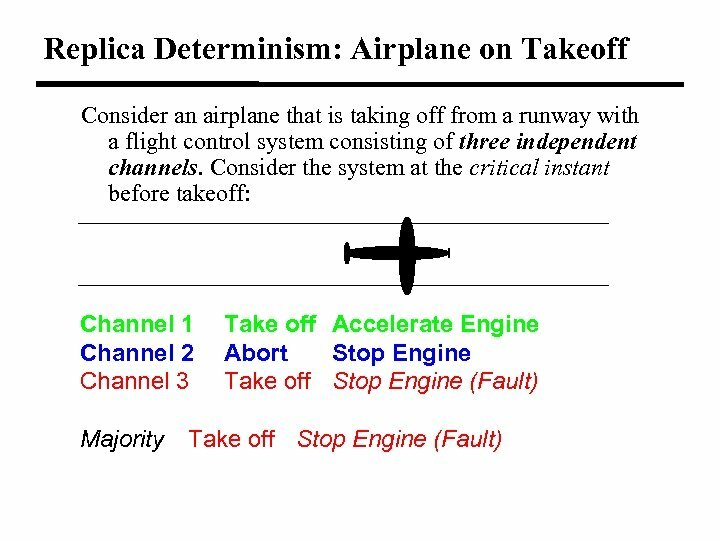 The safety argument is based on a combination of experimental evidence about the expected failure modes and failures rates of fault-containment units (FCU) and a formal dependability model that depicts the system structure from the point of view of dependability. Independence of the FCUs is a critical issue. 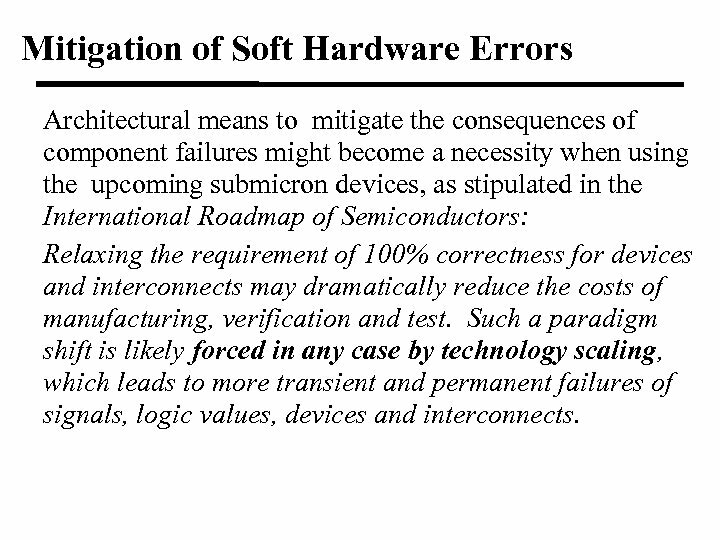 Mitigation of Soft Hardware Errors Architectural means to mitigate the consequences of component failures might become a necessity when using the upcoming submicron devices, as stipulated in the International Roadmap of Semiconductors: Relaxing the requirement of 100% correctness for devices and interconnects may dramatically reduce the costs of manufacturing, verification and test. 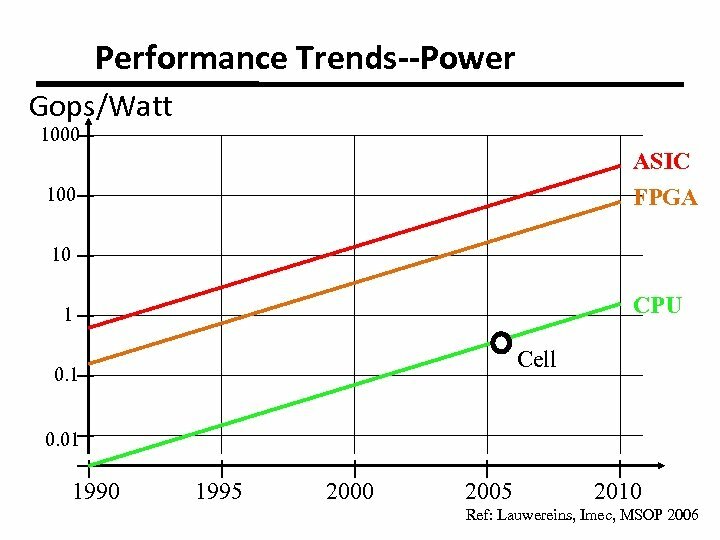 Such a paradigm shift is likely forced in any case by technology scaling, which leads to more transient and permanent failures of signals, logic values, devices and interconnects. Need for a Global Time A valuable lesson from the August 14 blackout is the importance of having time-synchronized system data recorders. The Task Force’s investigators labored over thousands of data items to determine the sequence of events, much like putting together small pieces of a very large puzzle. That process would have been significantly faster and easier if there had been wider use of synchronized data recording devices. 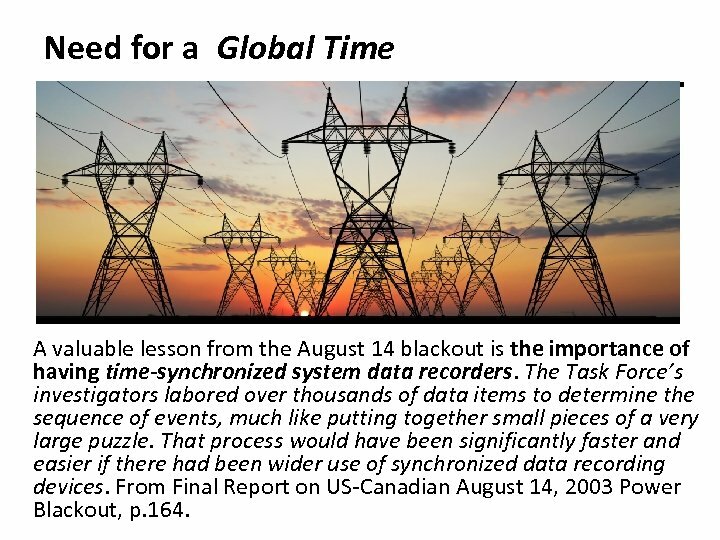 From Final Report on US-Canadian August 14, 2003 Power Blackout, p. 164. 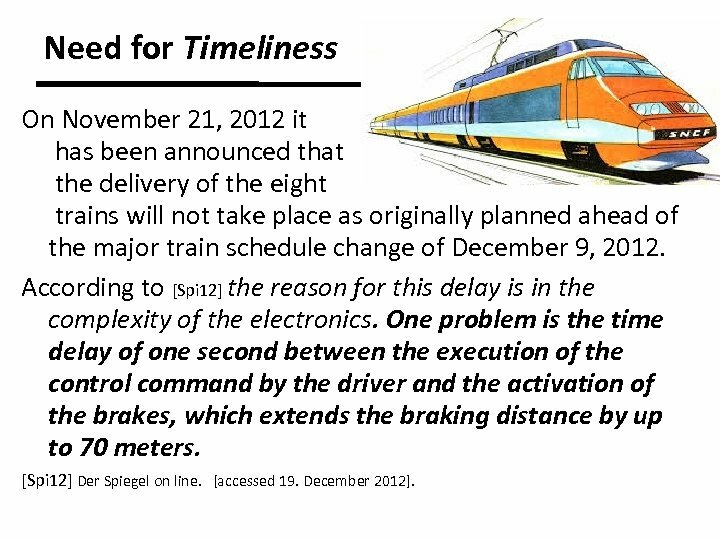 Need for Timeliness On November 21, 2012 it has been announced that the delivery of the eight trains will not take place as originally planned ahead of the major train schedule change of December 9, 2012. 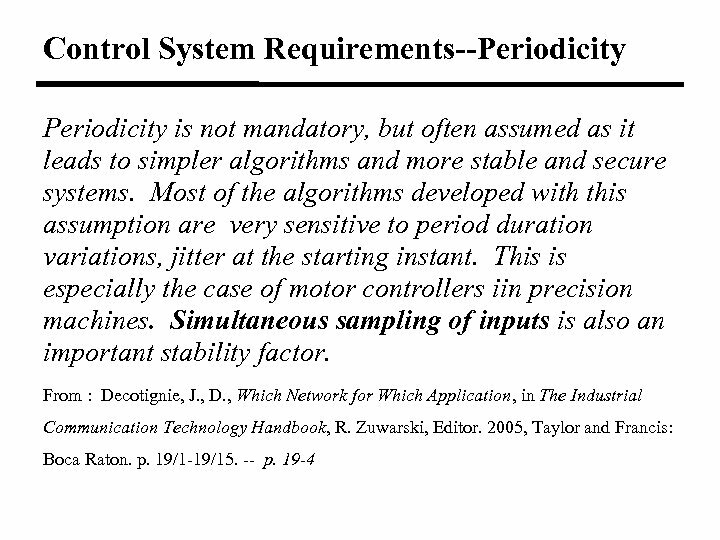 According to [Spi 12] the reason for this delay is in the complexity of the electronics. One problem is the time delay of one second between the execution of the control command by the driver and the activation of the brakes, which extends the braking distance by up to 70 meters. [Spi 12] Der Spiegel on line. [accessed 19. December 2012]. 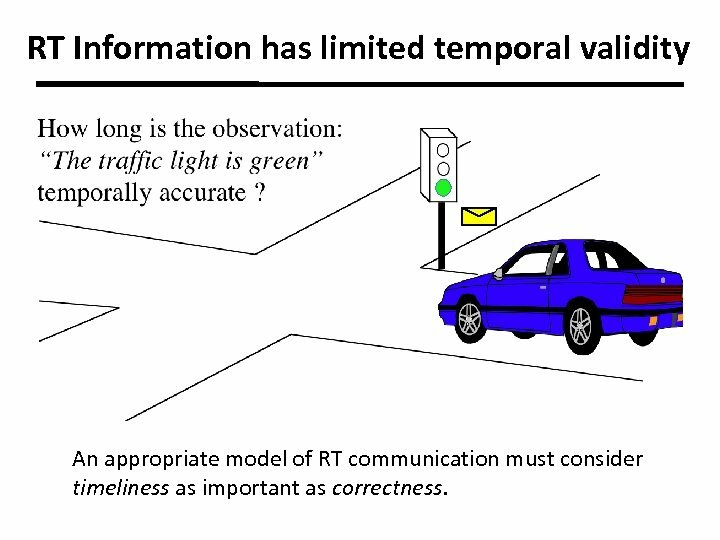 RT Information has limited temporal validity An appropriate model of RT communication must consider timeliness as important as correctness. 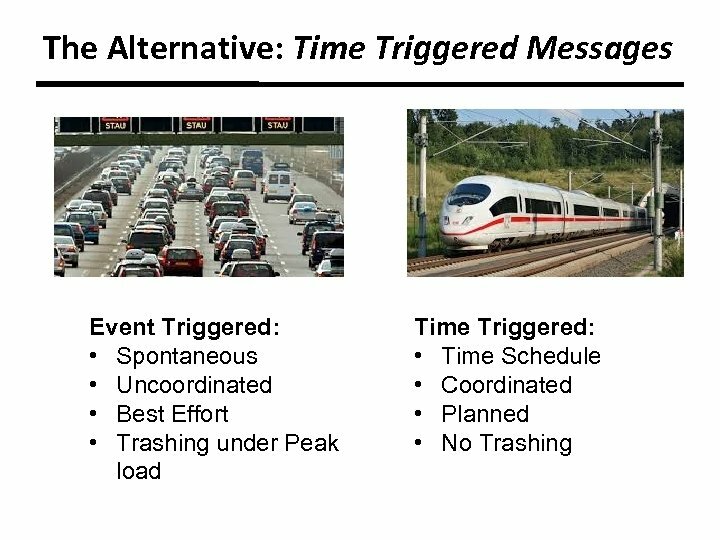 Event-Triggered Communication • A new message is sent, whenever a significant event occurs. • Delay in the queues is unpredictable. 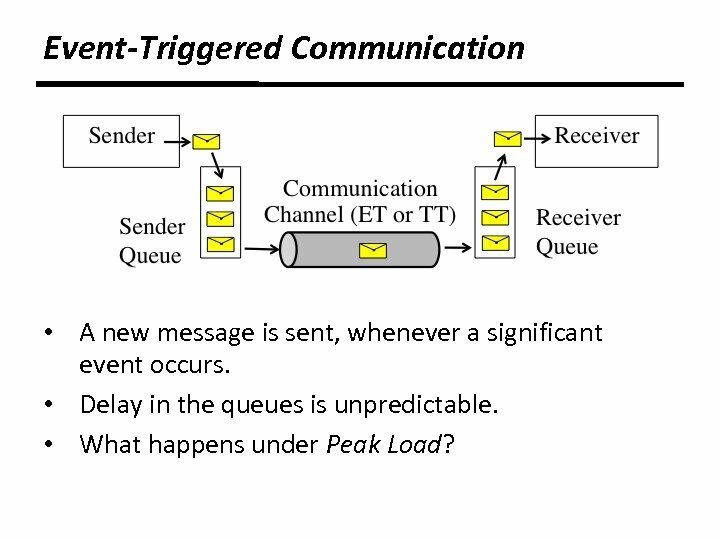 • What happens under Peak Load? 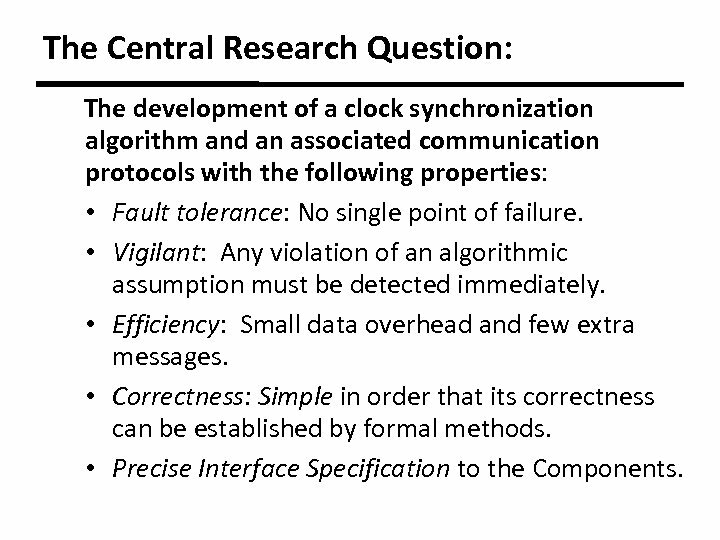 The Central Research Question: The development of a clock synchronization algorithm and an associated communication protocols with the following properties: • Fault tolerance: No single point of failure. • Vigilant: Any violation of an algorithmic assumption must be detected immediately. • Efficiency: Small data overhead and few extra messages. • Correctness: Simple in order that its correctness can be established by formal methods. 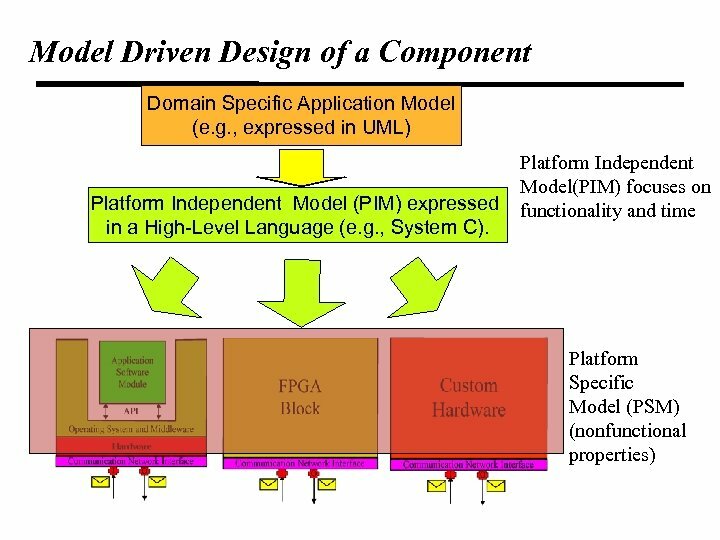 • Precise Interface Specification to the Components. One Tick Difference: What Does it Mean? 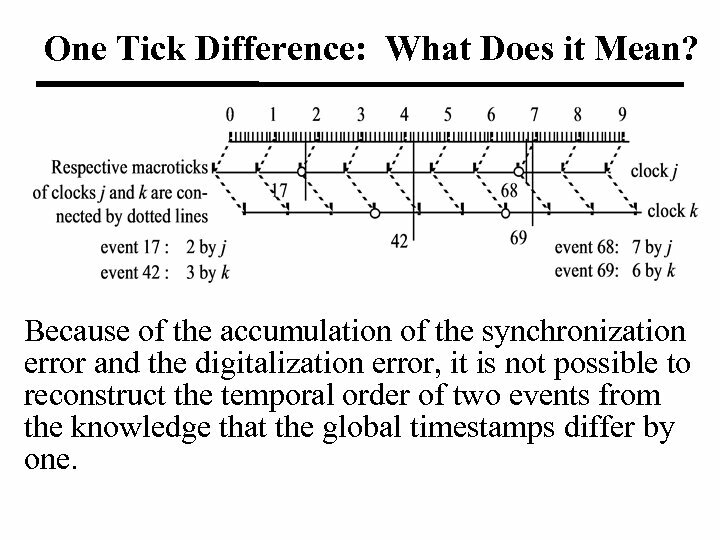 Because of the accumulation of the synchronization error and the digitalization error, it is not possible to reconstruct the temporal order of two events from the knowledge that the global timestamps differ by one. 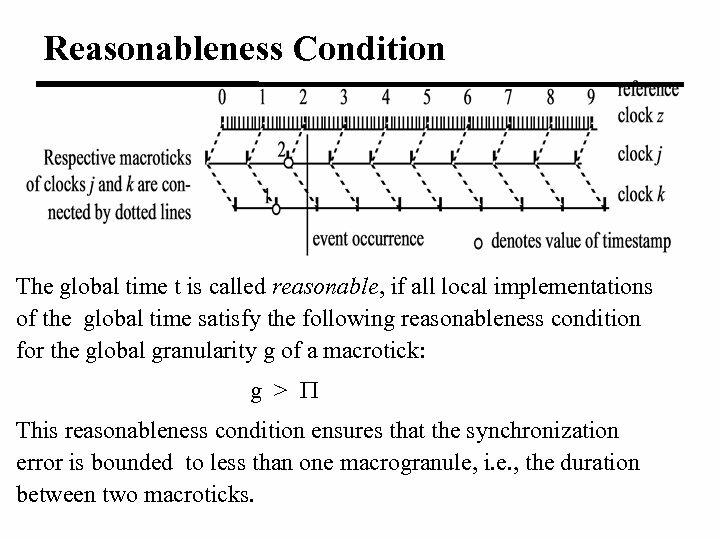 Reasonableness Condition The global time t is called reasonable, if all local implementations of the global time satisfy the following reasonableness condition for the global granularity g of a macrotick: g > This reasonableness condition ensures that the synchronization error is bounded to less than one macrogranule, i. e. , the duration between two macroticks. 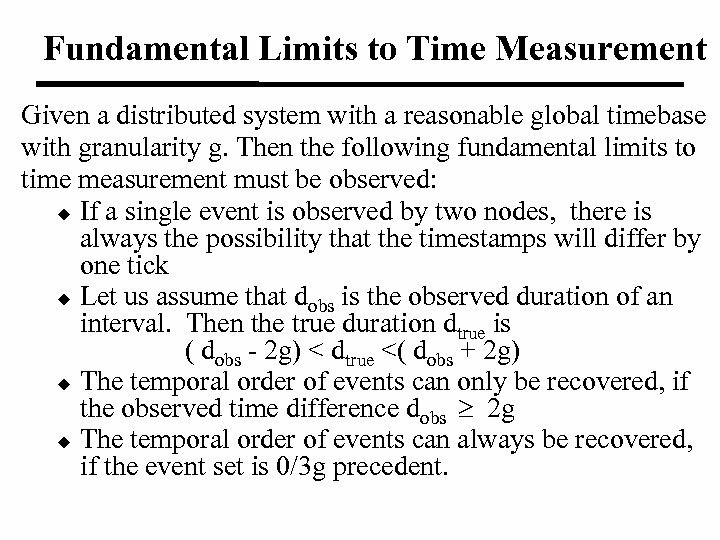 Fundamental Limits to Time Measurement Given a distributed system with a reasonable global timebase with granularity g. Then the following fundamental limits to time measurement must be observed: u If a single event is observed by two nodes, there is always the possibility that the timestamps will differ by one tick u Let us assume that dobs is the observed duration of an interval. 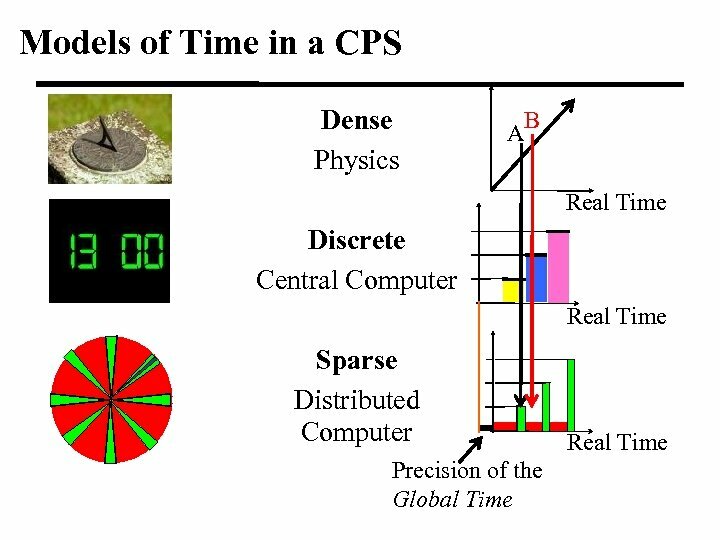 Then the true duration dtrue is ( dobs - 2 g) < dtrue <( dobs + 2 g) u The temporal order of events can only be recovered, if the observed time difference dobs 2 g u The temporal order of events can always be recovered, if the event set is 0/3 g precedent. 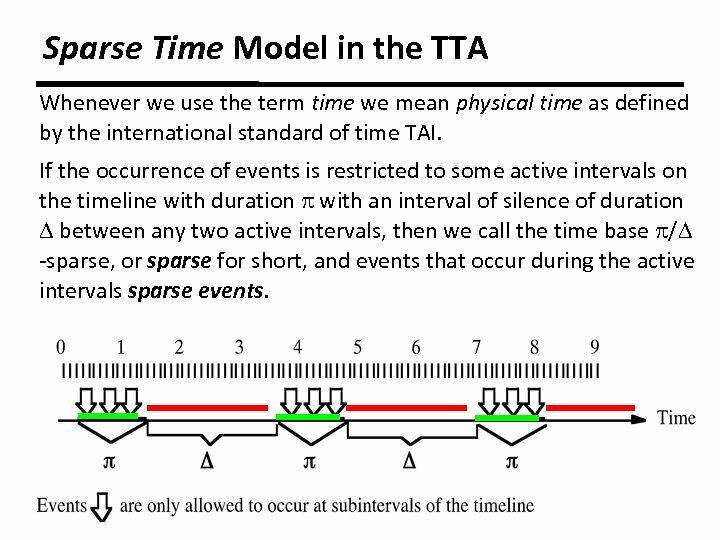 Sparse Time Model in the TTA Whenever we use the term time we mean physical time as defined by the international standard of time TAI. 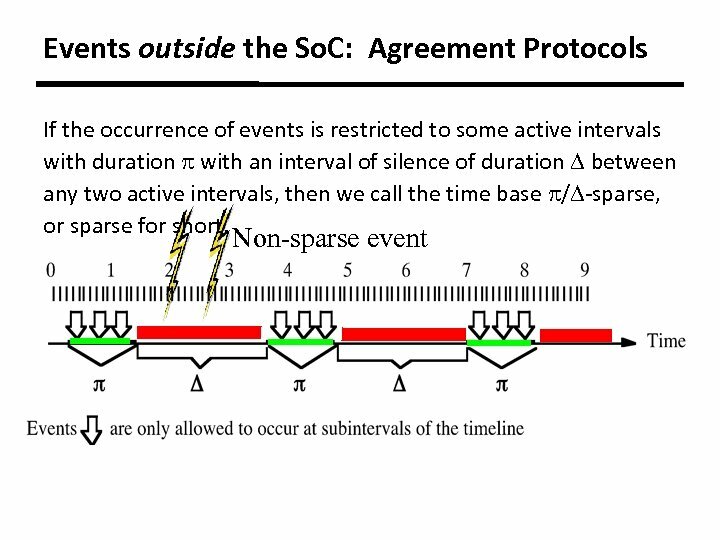 If the occurrence of events is restricted to some active intervals on the timeline with duration with an interval of silence of duration between any two active intervals, then we call the time base / -sparse, or sparse for short, and events that occur during the active intervals sparse events. 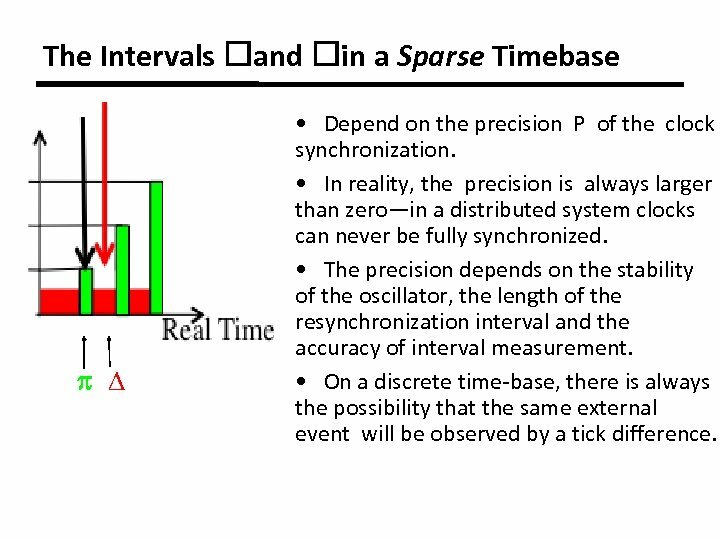 The Intervals and in a Sparse Timebase • Depend on the precision P of the clock synchronization. 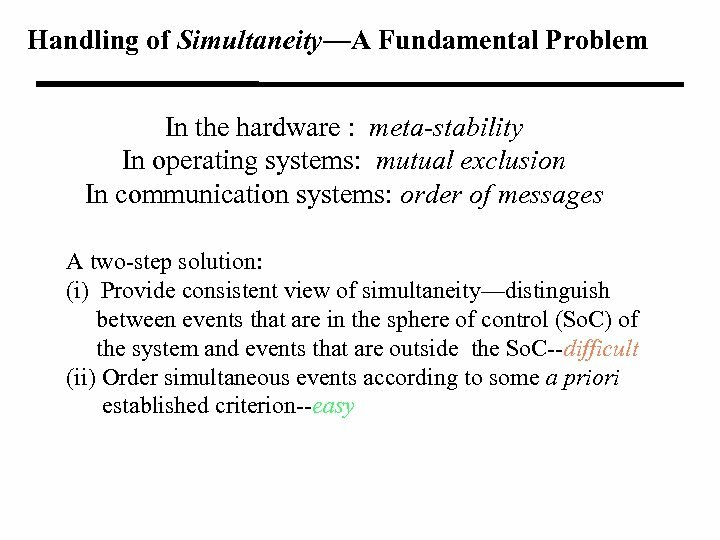 • In reality, the precision is always larger than zero—in a distributed system clocks can never be fully synchronized. 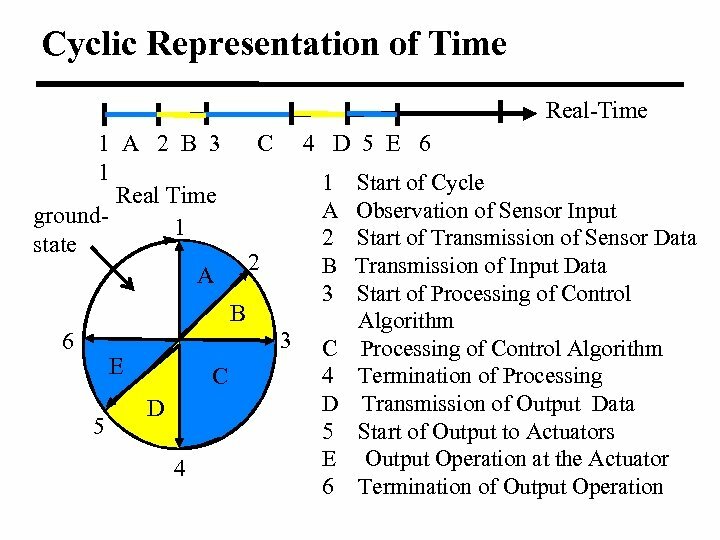 • The precision depends on the stability of the oscillator, the length of the resynchronization interval and the accuracy of interval measurement. 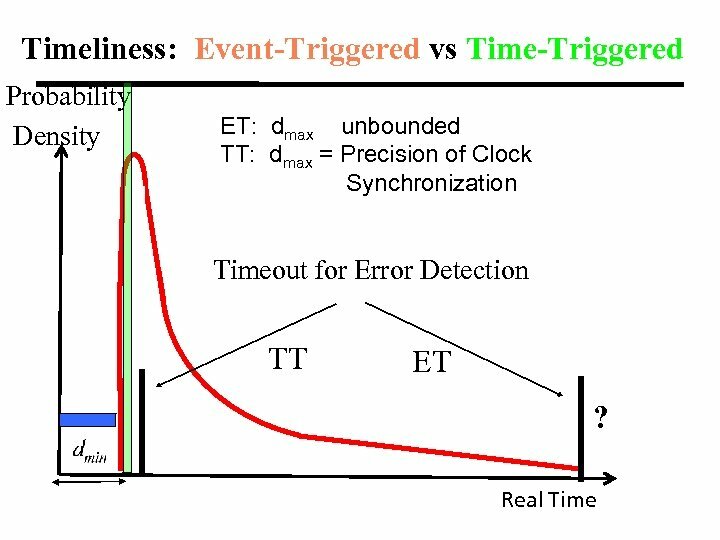 • On a discrete time-base, there is always the possibility that the same external event will be observed by a tick difference. 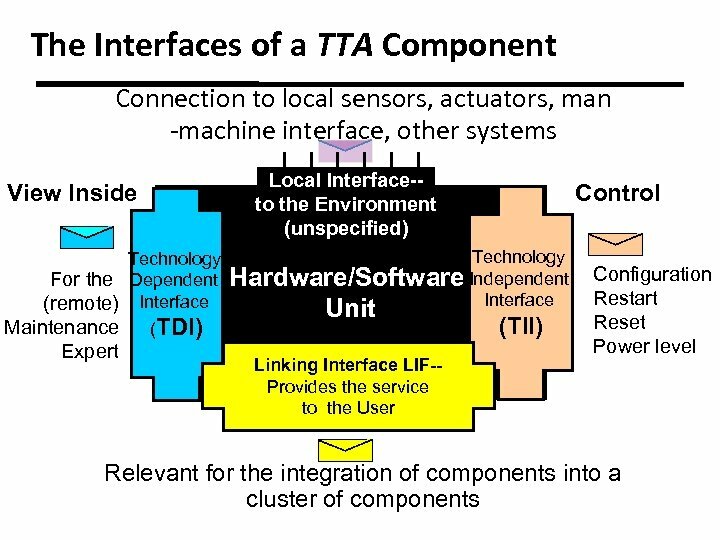 What is a TTA Component? 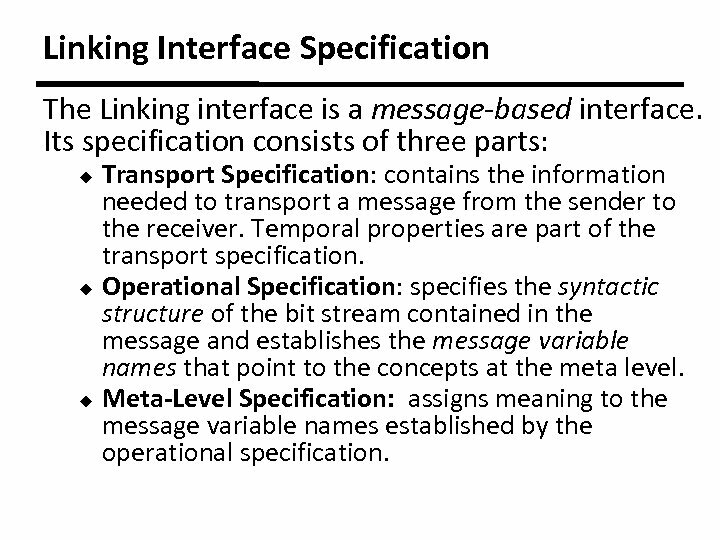 u u Hardware/software unit that accepts input messages, provides a useful service, maintains internal state, and produces after some elapsed time output messages containing the results. 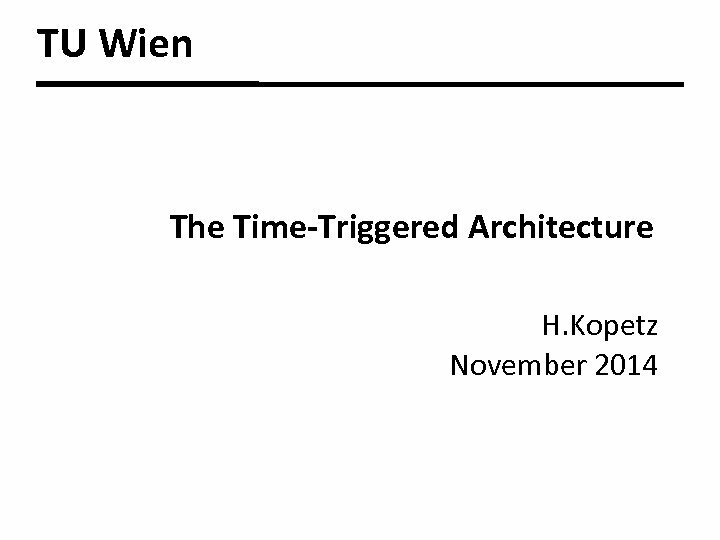 It is aware of the progression of physical time Unit of abstraction, the behavior of which is captured in a high-level concept that is used to capture the services of a subsystem. 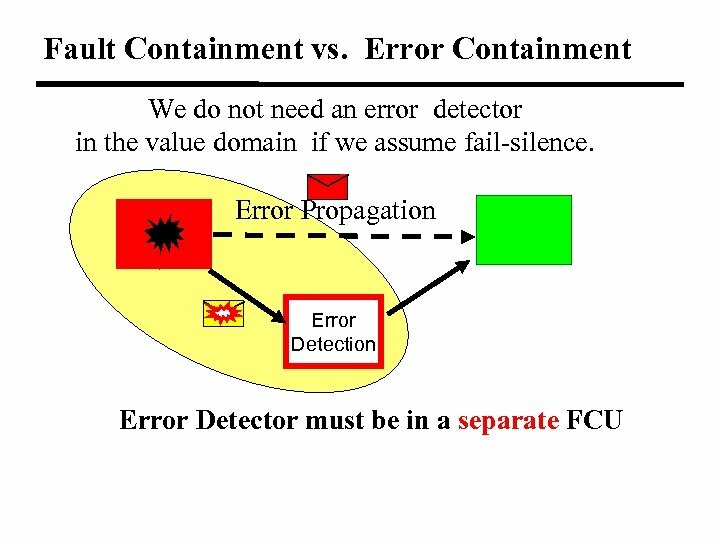 Fault-Containment-Unit (FCU) that maintains the abstraction in case of fault occurrence and contains the immediate effects of a fault (a fault can propagate from a faulty component to a component that has not been affected by the fault only by erroneous messages). 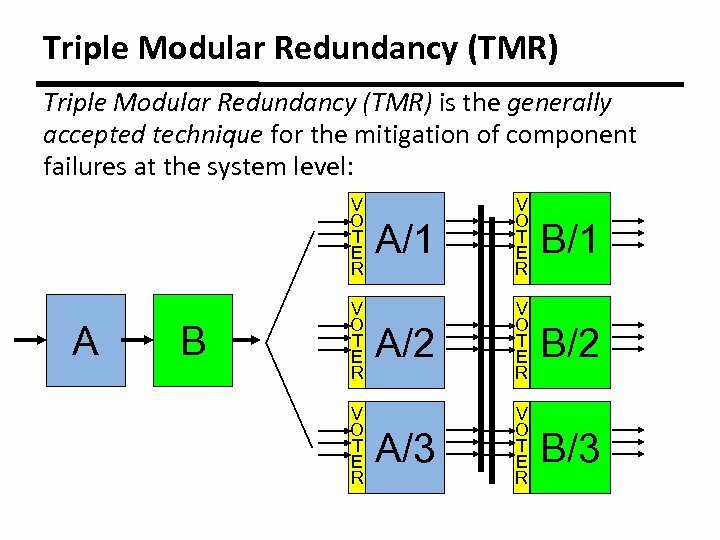 Unit of restart, replication and reconfiguration in order to enable the implementation of robustness and fault-tolerance. 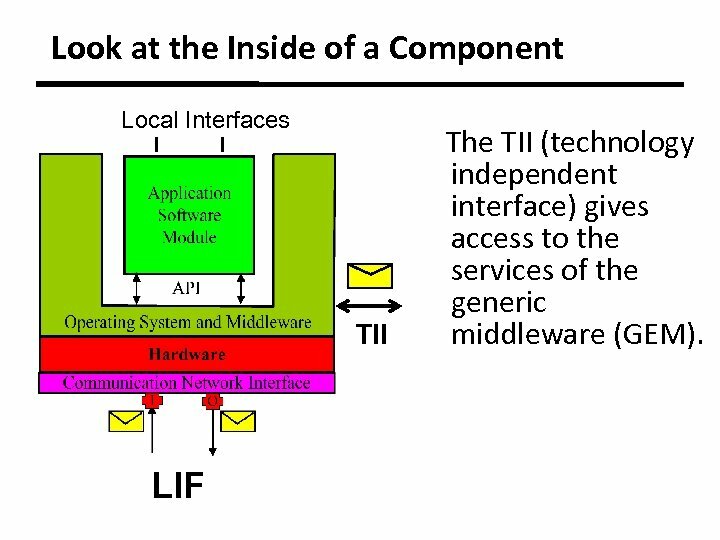 Look at the Inside of a Component Local Interfaces TII LIF The TII (technology independent interface) gives access to the services of the generic middleware (GEM). 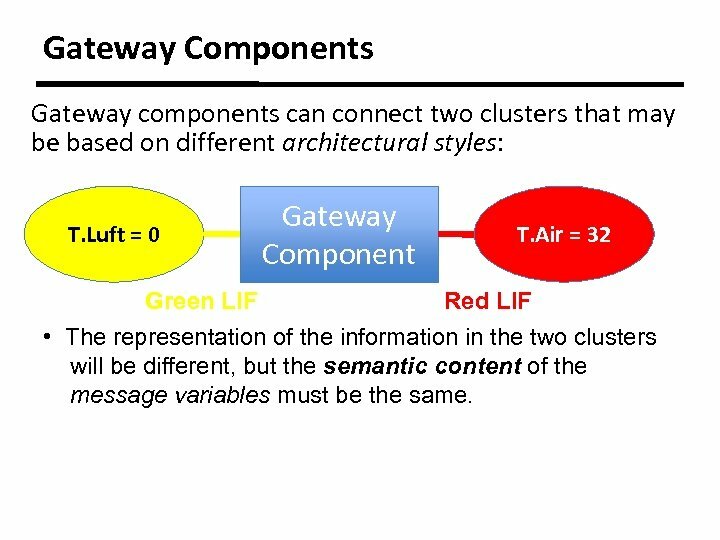 Gateway Components Gateway components can connect two clusters that may be based on different architectural styles: T. Luft = 0 Green LIF Gateway Component T. Air = 32 Red LIF • The representation of the information in the two clusters will be different, but the semantic content of the message variables must be the same. 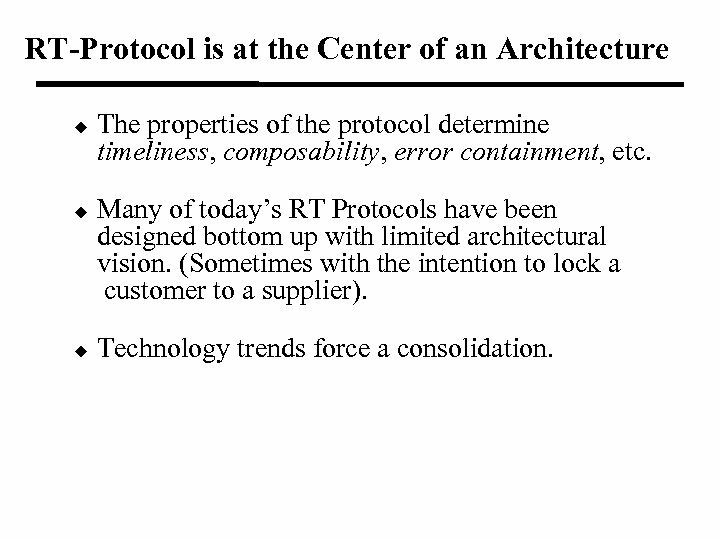 RT-Protocol is at the Center of an Architecture u u u The properties of the protocol determine timeliness, composability, error containment, etc. 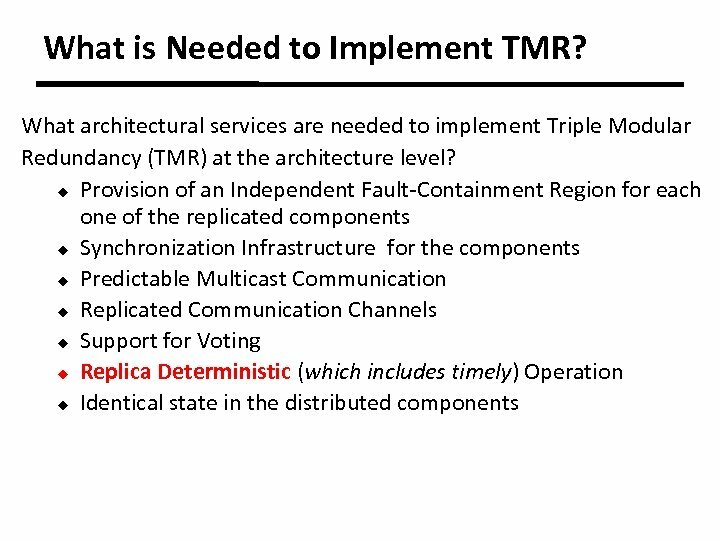 Many of today’s RT Protocols have been designed bottom up with limited architectural vision. (Sometimes with the intention to lock a customer to a supplier). Technology trends force a consolidation. 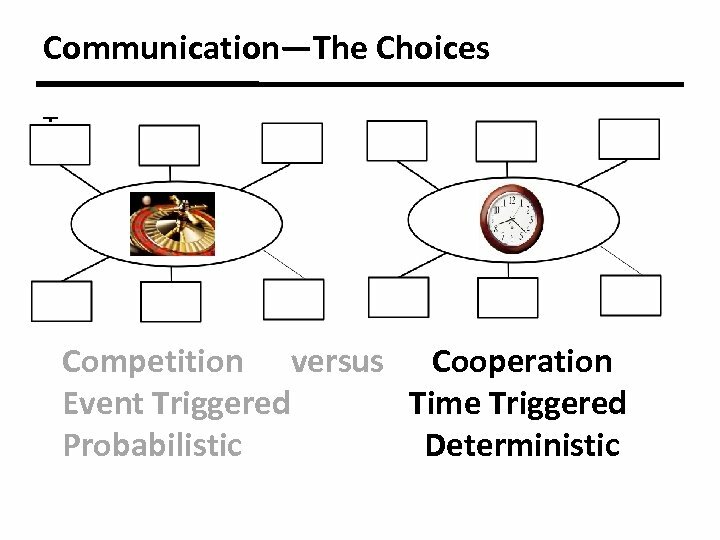 Determinism of a Communication Channel The behavior of a communication channel is called deterministic if (as seen from an omniscient external observer): u A message is delivered before an a priori known instant (timeliness). 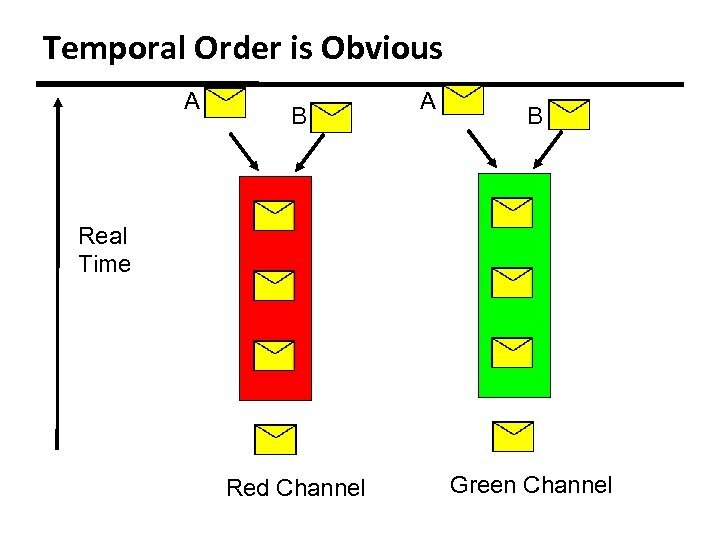 u The receive order of the messages is same as the send order. 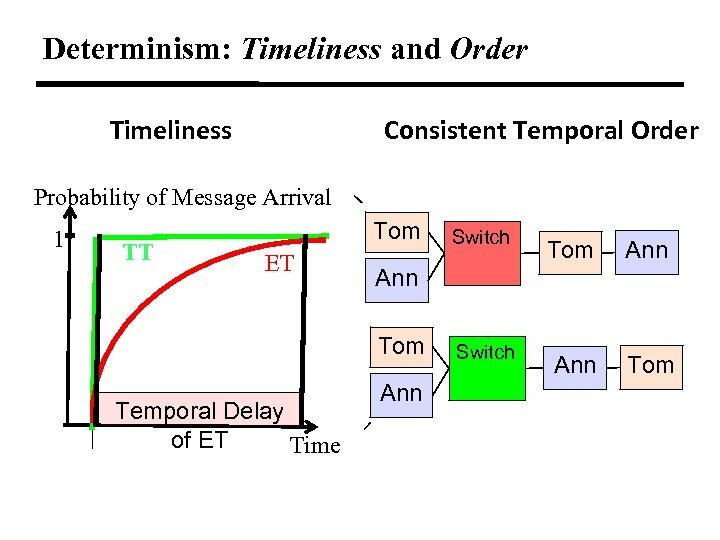 The send order among all messages is established by the temporal order of the send instants of the messages as observed by an omniscient observer. 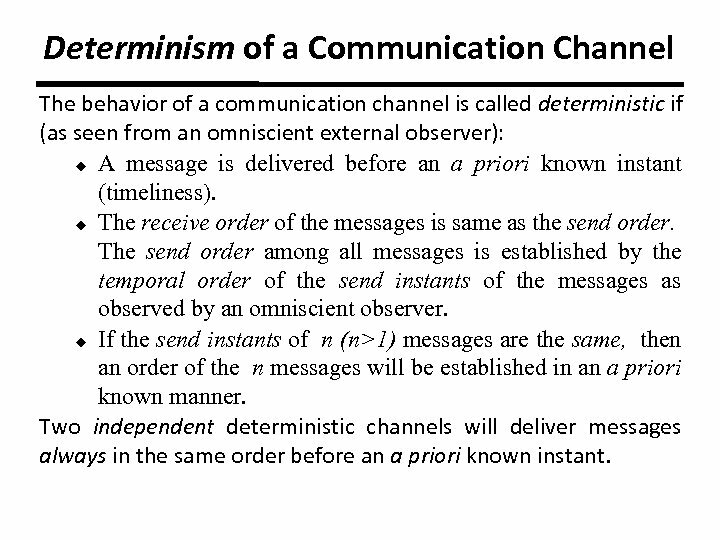 u If the send instants of n (n>1) messages are the same, then an order of the n messages will be established in an a priori known manner. 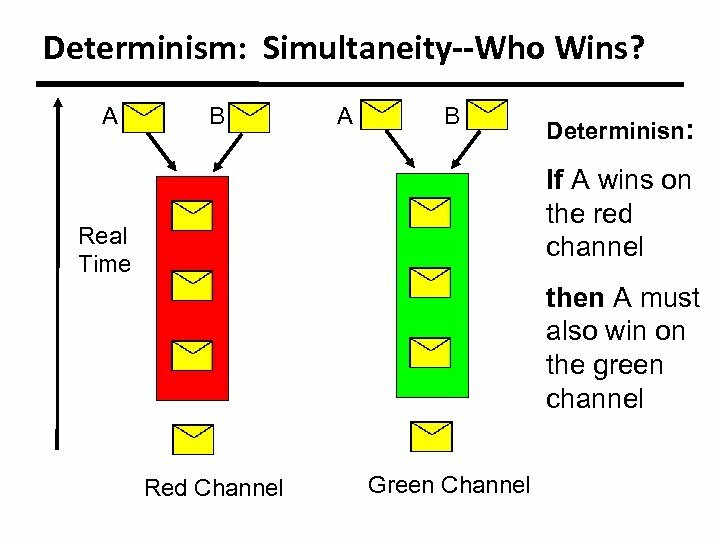 Two independent deterministic channels will deliver messages always in the same order before an a priori known instant. 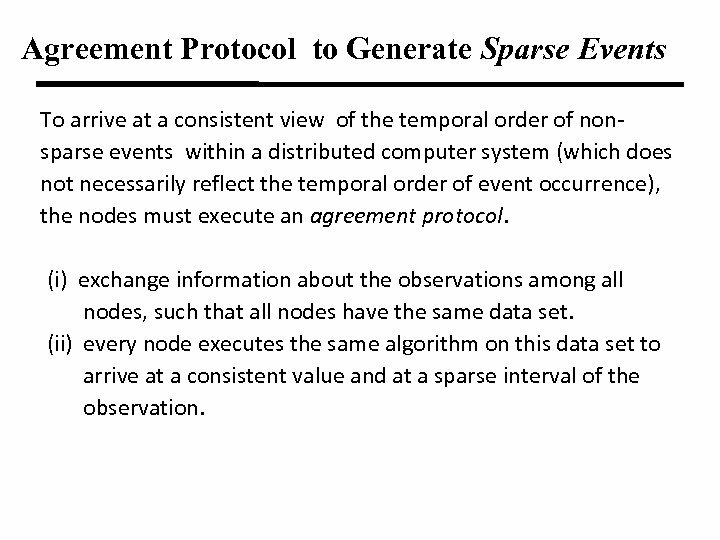 Agreement Protocol to Generate Sparse Events To arrive at a consistent view of the temporal order of nonsparse events within a distributed computer system (which does not necessarily reflect the temporal order of event occurrence), the nodes must execute an agreement protocol. (i) exchange information about the observations among all nodes, such that all nodes have the same data set. 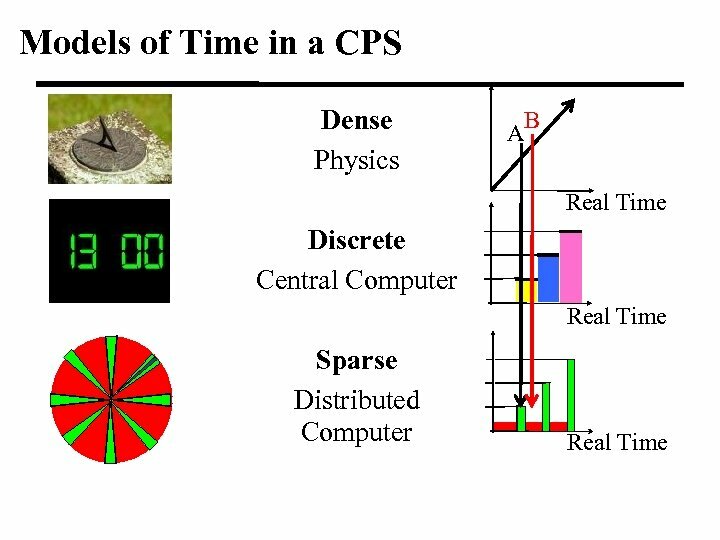 (ii) every node executes the same algorithm on this data set to arrive at a consistent value and at a sparse interval of the observation. 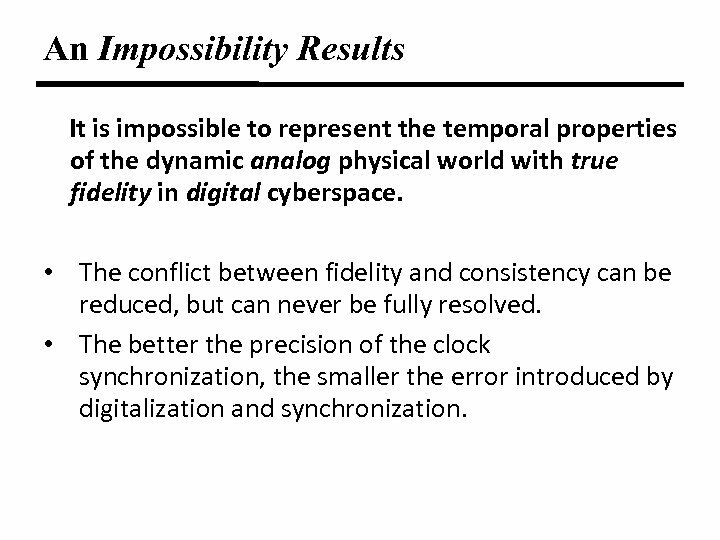 An Impossibility Results It is impossible to represent the temporal properties of the dynamic analog physical world with true fidelity in digital cyberspace. • The conflict between fidelity and consistency can be reduced, but can never be fully resolved. 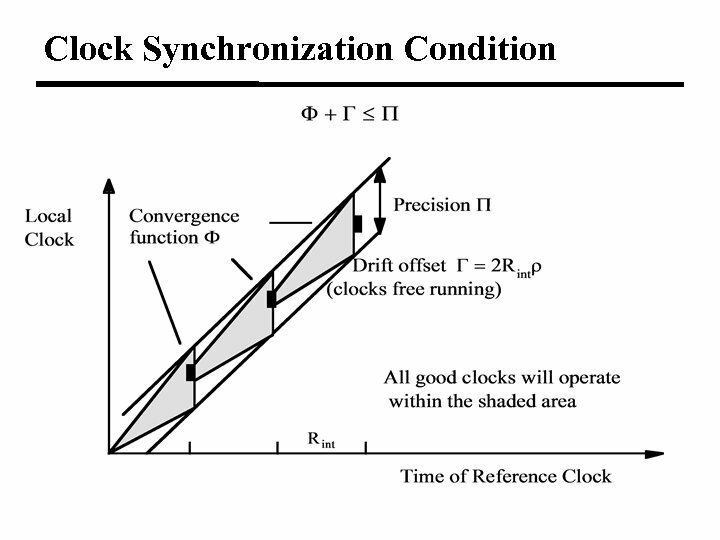 • The better the precision of the clock synchronization, the smaller the error introduced by digitalization and synchronization. 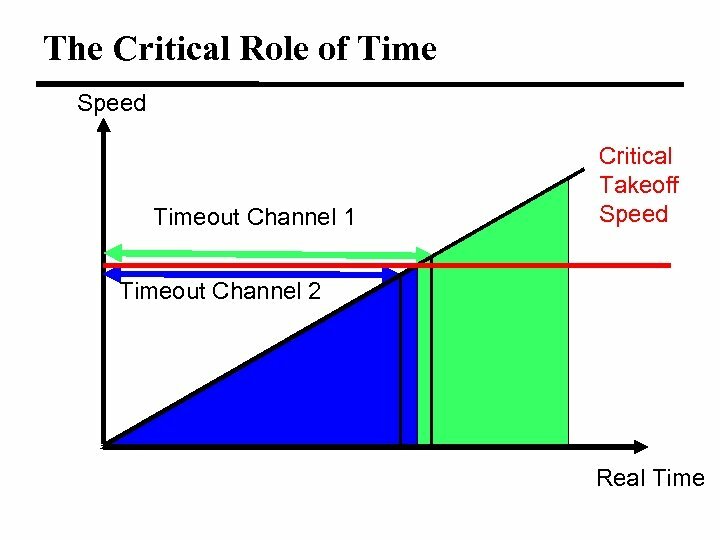 Temporal Error Containment by the CS It is impossible to maintain the communication among the correct components of a RTcluster if the temporal errors caused by a faulty component are not contained. 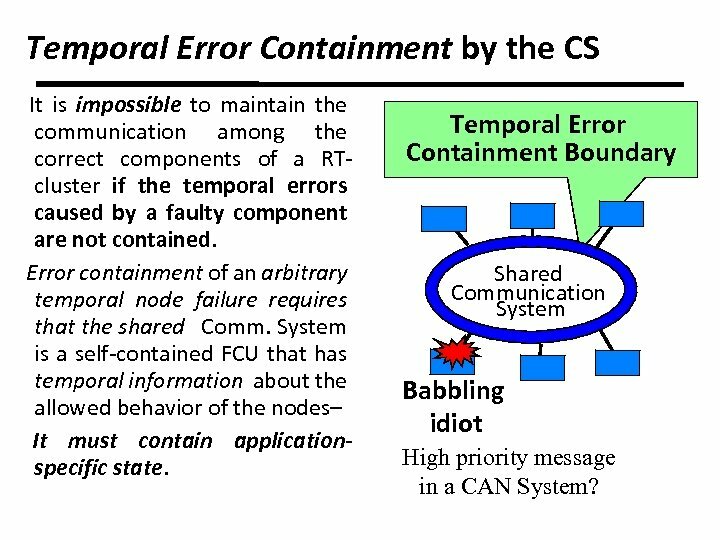 Error containment of an arbitrary temporal node failure requires that the shared Comm. 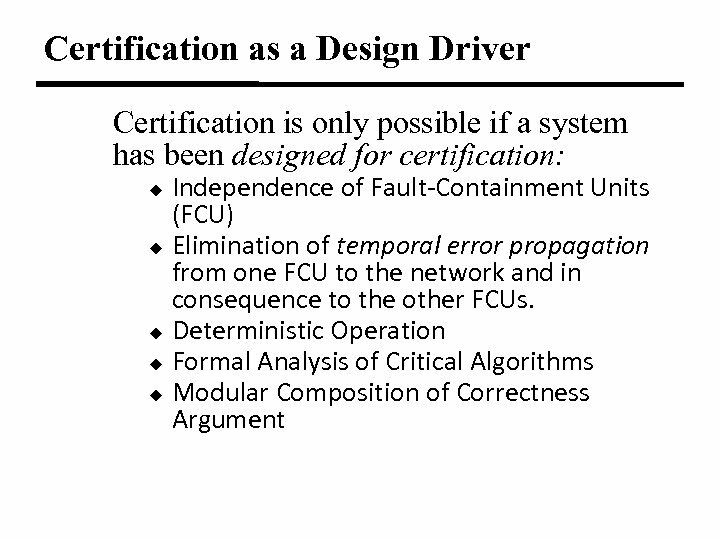 System is a self-contained FCU that has temporal information about the allowed behavior of the nodes– It must contain applicationspecific state. 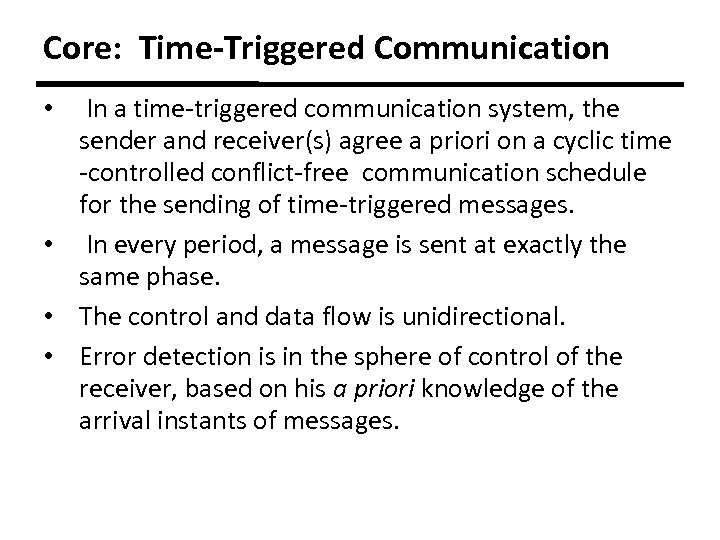 Temporal Error Containment Boundary Shared Communication System Babbling idiot High priority message in a CAN System? 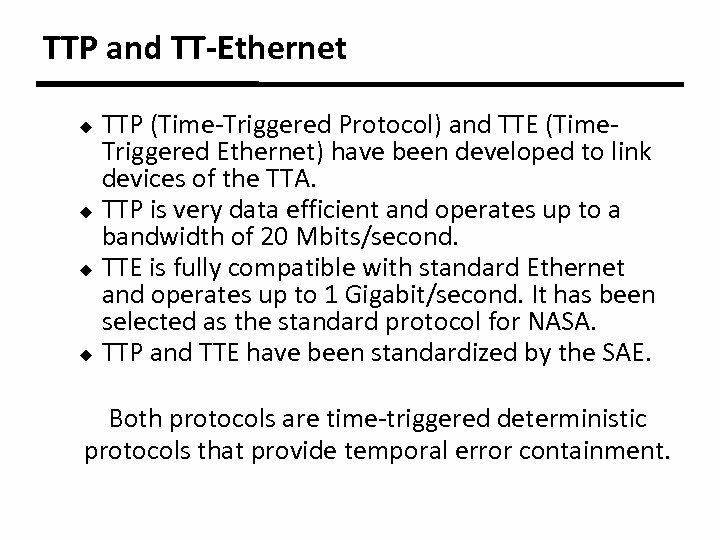 TTP and TT-Ethernet TTP (Time-Triggered Protocol) and TTE (Time. 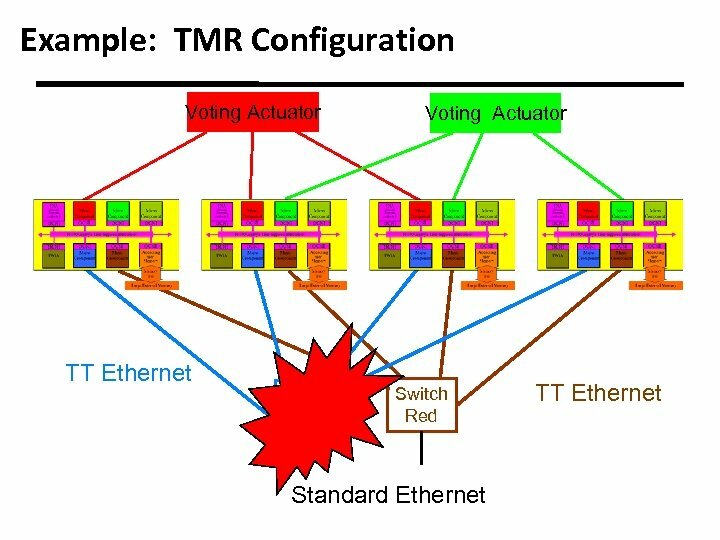 Triggered Ethernet) have been developed to link devices of the TTA. 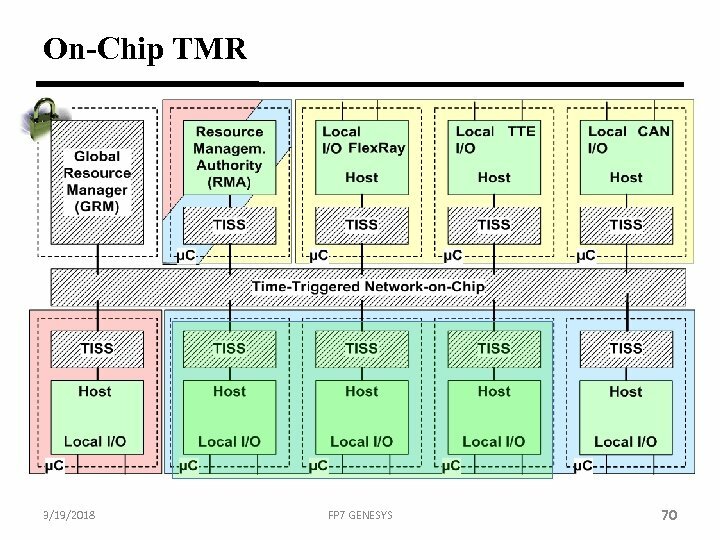 u TTP is very data efficient and operates up to a bandwidth of 20 Mbits/second. u TTE is fully compatible with standard Ethernet and operates up to 1 Gigabit/second. It has been selected as the standard protocol for NASA. 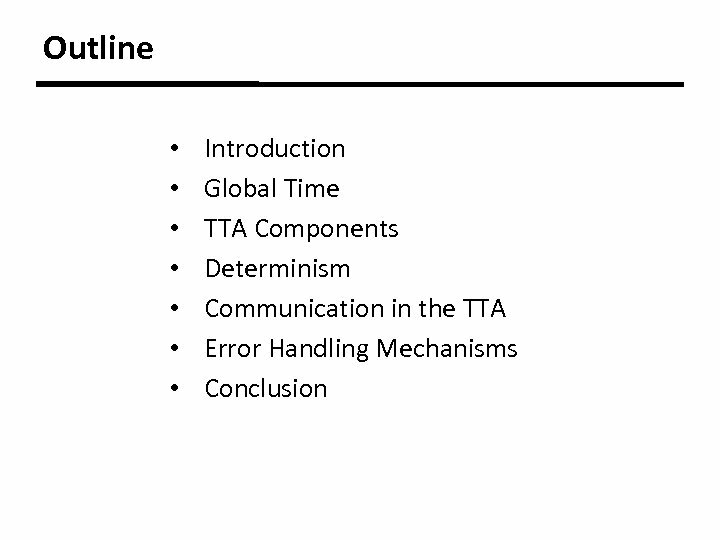 u TTP and TTE have been standardized by the SAE. u Both protocols are time-triggered deterministic protocols that provide temporal error containment. 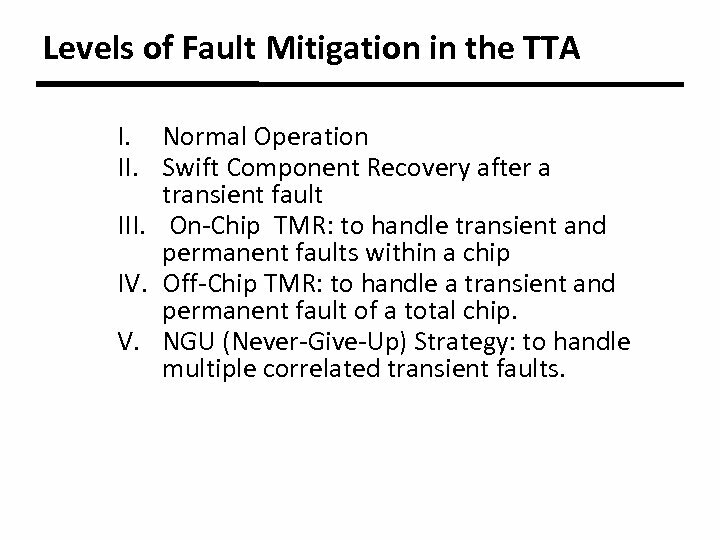 Levels of Fault Mitigation in the TTA I. Normal Operation II. Swift Component Recovery after a transient fault III. 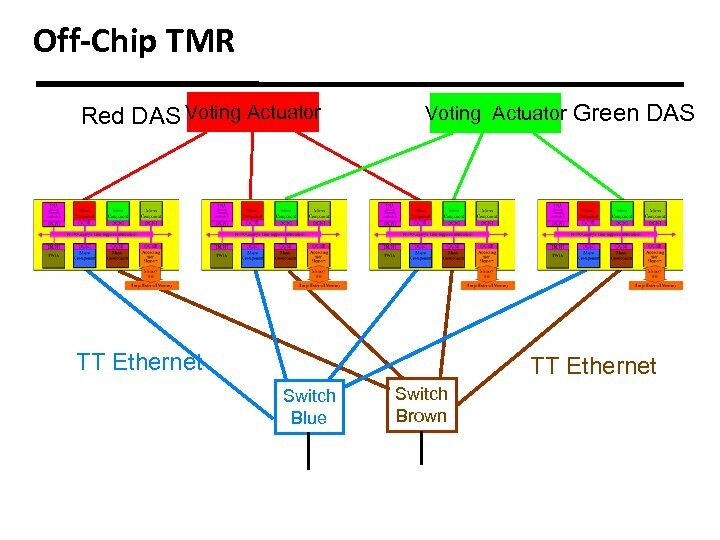 On-Chip TMR: to handle transient and permanent faults within a chip IV. 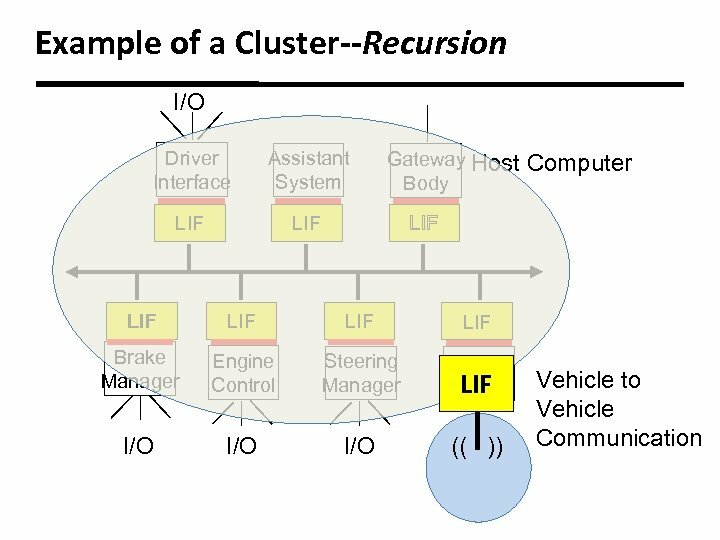 Off-Chip TMR: to handle a transient and permanent fault of a total chip. 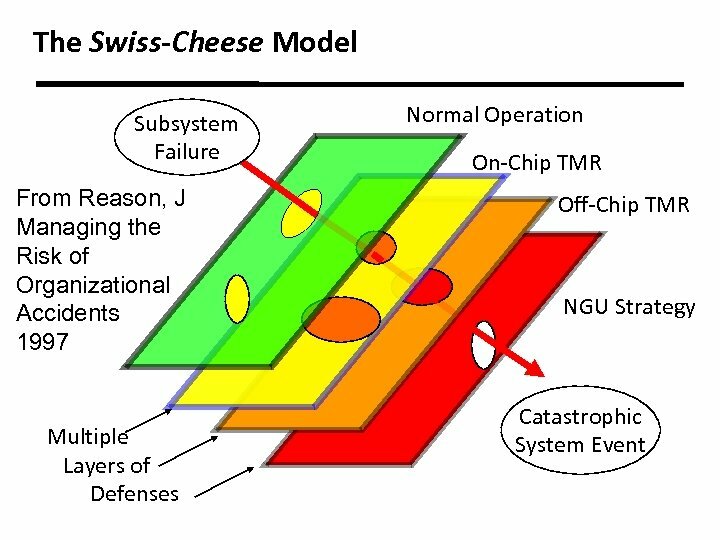 V. NGU (Never-Give-Up) Strategy: to handle multiple correlated transient faults. 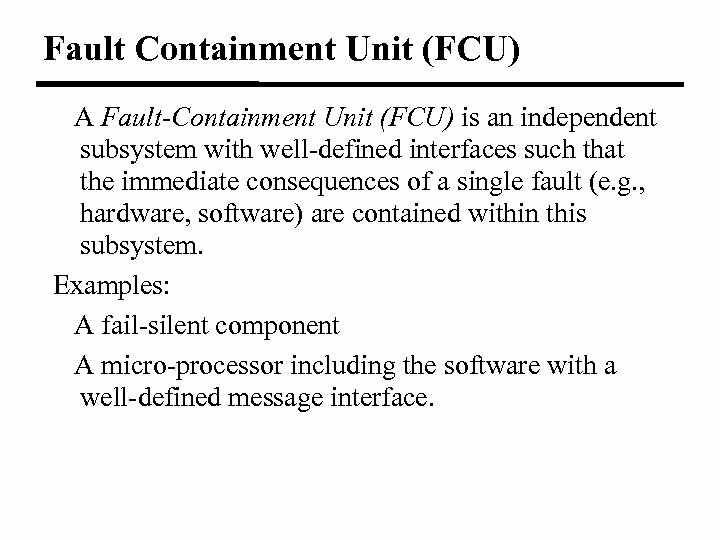 Fault Containment Unit (FCU) A Fault-Containment Unit (FCU) is an independent subsystem with well-defined interfaces such that the immediate consequences of a single fault (e. g. , hardware, software) are contained within this subsystem. 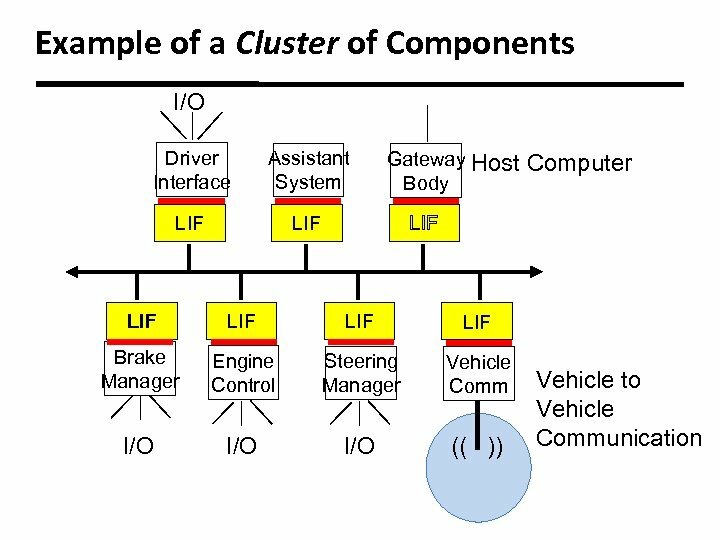 Examples: A fail-silent component A micro-processor including the software with a well-defined message interface. 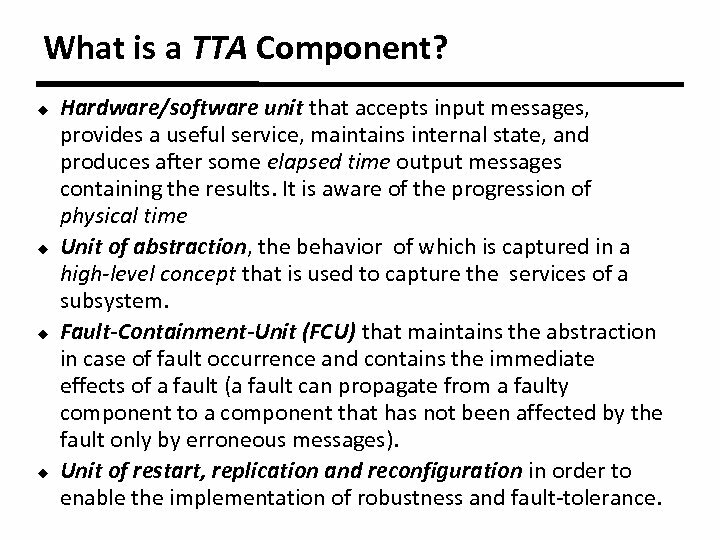 Fault-Tolerant Unit (FTU) A fault-tolerant unit (FTU) is a set of actively redundant FCUs (components) that provide a fault tolerant service to its environment: u FTUs have to receive identical input messages in the same order u FTUs have to operate in replica determinism u The output messages of FTUs should be idempotent u As long as a defined subset of the components of the FTU is operational, the FTU is considered operational FTUs provide the continuous service by fault masking. 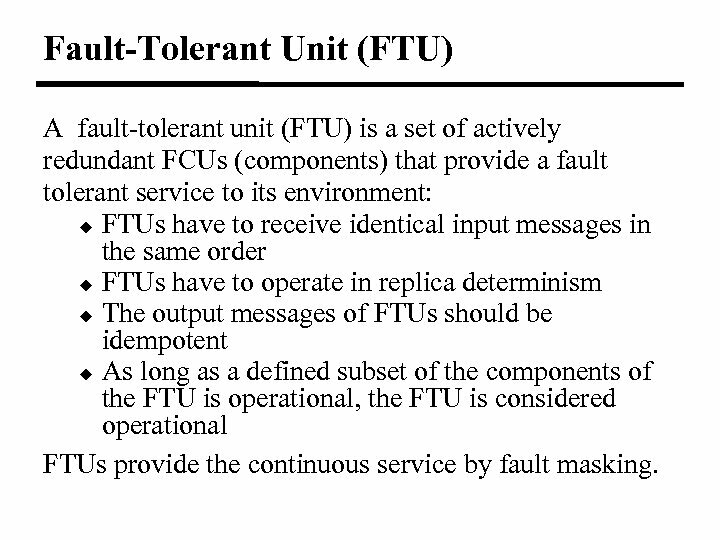 Fault Masking: How Many FCUs in an FTU? 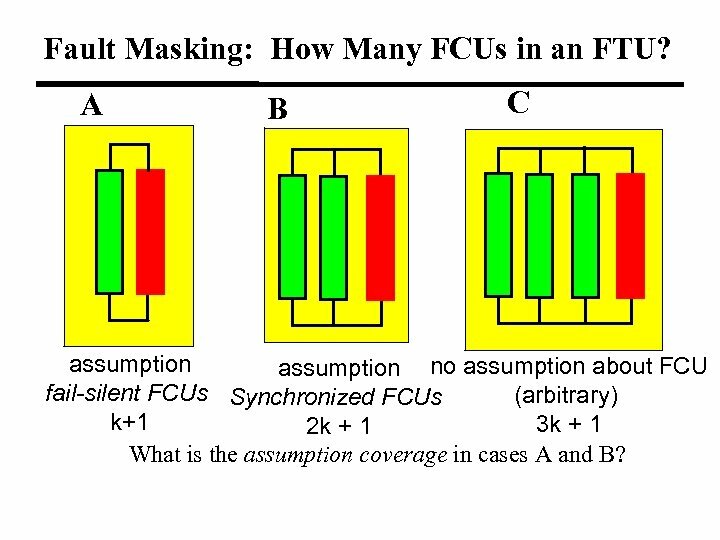 A B C assumption no assumption about FCU fail-silent FCUs Synchronized FCUs (arbitrary) k+1 3 k + 1 2 k + 1 What is the assumption coverage in cases A and B? 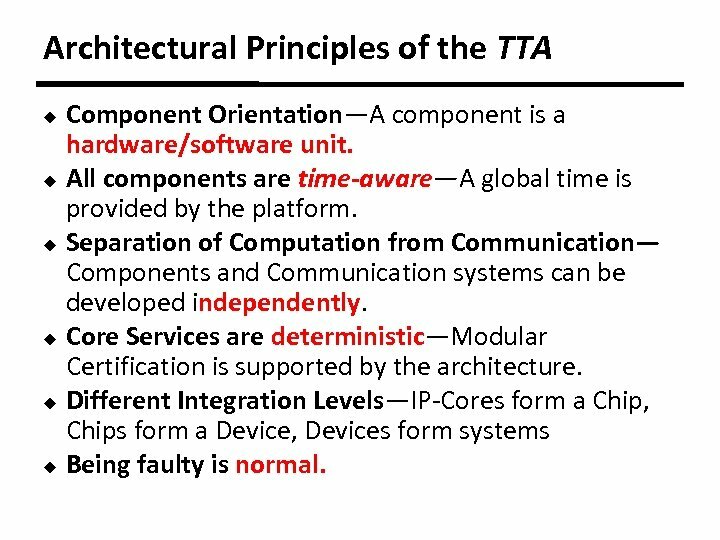 Conclusion • The TTA provides a framework for the componentbased design of dependable distributed real-time systems. 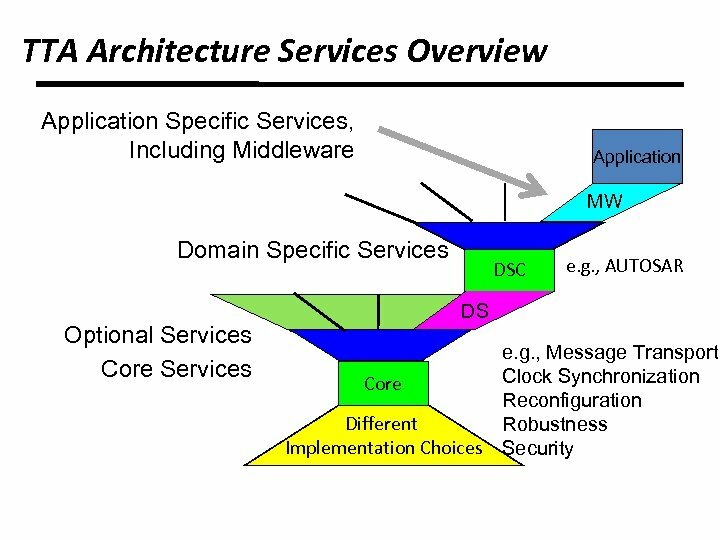 • The framework can be adapted to different application domains by a hierarchical composition of services. 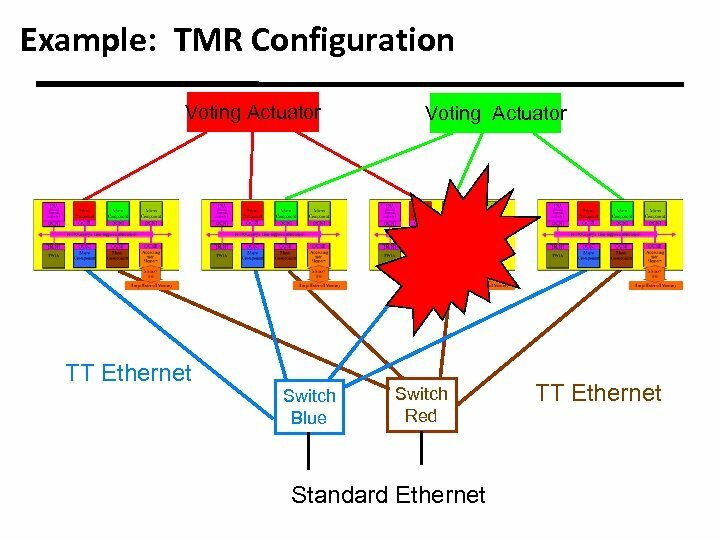 • The fault-tolerance mechanism of the TTA mask transient and permanent failures. 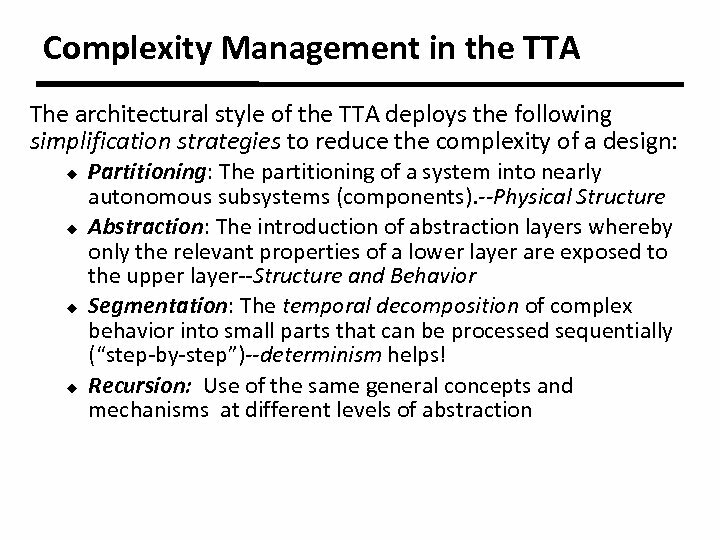 • The conceptual simplicity of the TTA supports the implementation of fast recovery actions in cyberphysical systems. 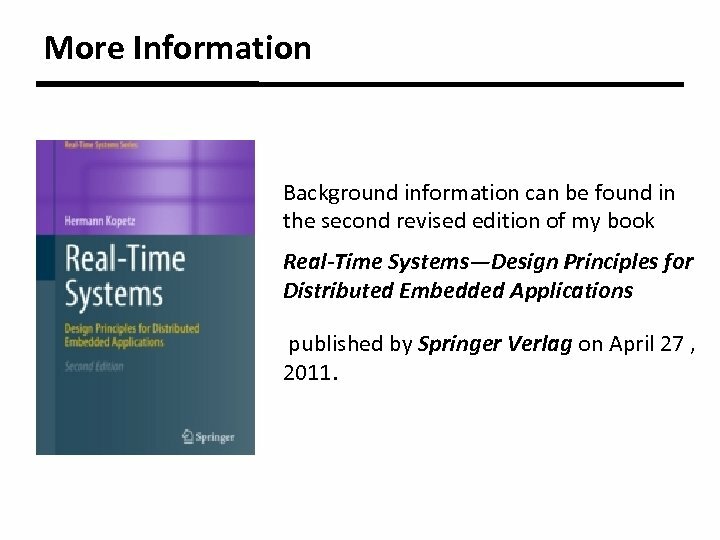 More Information Background information can be found in the second revised edition of my book Real-Time Systems—Design Principles for Distributed Embedded Applications published by Springer Verlag on April 27 , 2011. 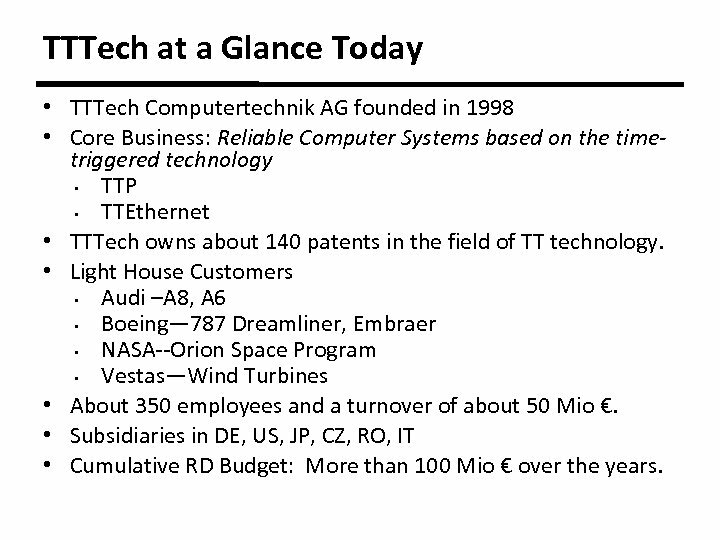 TTTech at a Glance Today • TTTech Computertechnik AG founded in 1998 • Core Business: Reliable Computer Systems based on the timetriggered technology • TTP • TTEthernet • TTTech owns about 140 patents in the field of TT technology. • Light House Customers • Audi –A 8, A 6 • Boeing— 787 Dreamliner, Embraer • NASA--Orion Space Program • Vestas—Wind Turbines • About 350 employees and a turnover of about 50 Mio €. • Subsidiaries in DE, US, JP, CZ, RO, IT • Cumulative RD Budget: More than 100 Mio € over the years.